It’s always an exciting day when the new issue of Food & Wine magazine arrives. Jon and I both flip through it, scouring the recipes for things we think we could actually make. 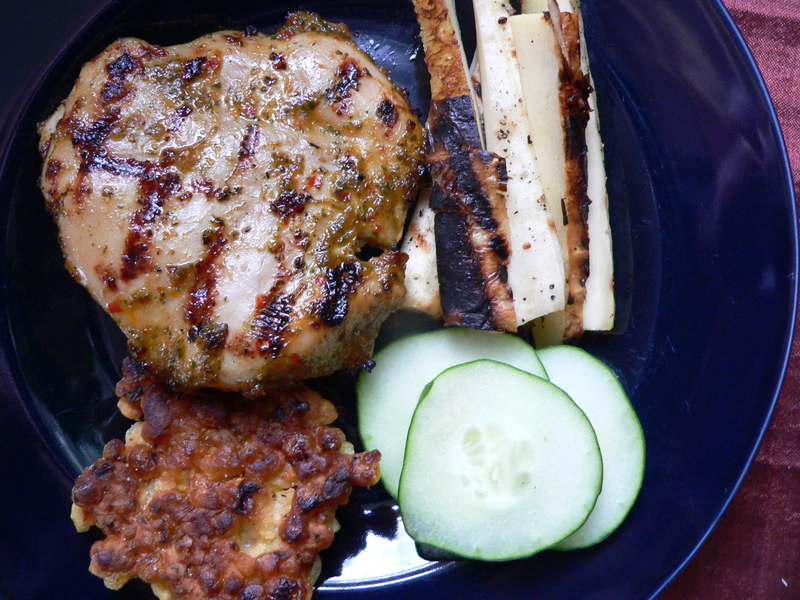 This time, Jon landed on a marinade that we used for Grilled Chicken: Spicy Thai Marinade with Basil and Cilantro. Contrary to what most think, we don’t often make meals- like with sides and such. We make a dish and that’s all we eat. Since it’s usually just Jon and I, we don’t worry about balancing it out; we certainly don’t worry about making large amounts of food, because it’s just us. With this dish, though, Jon did choose some sides and they complemented the dish perfectly: Grilled Parsnips and Corn Fritters. He threw in the cucumber to cool down our mouths because the marinade is spicy. In a mini food processor, pulse the basil, cilantro, garlic, Asian chile sauce and fish sauce until finely chopped. Add the lemon and lime zests and oil; pulse until the marinade is fairly smooth. Refrigerate for up to 3 days. Rub the marinade on 2 chicken breasts and let stand for 30 minutes. Grill chicken over medium-high heat until cooked through. Let chicken rest for 5 minutes before serving. Grill the cob. Cut corn from cob. Stir in egg yolk, flour and salt. Heat oil in large skillet over high heat. Drop in corn batter a heaping tablespoon at a time, without crowding. Reduce the heat to medium and cook, turning once, until browned on both sides, 2-3 mins per side. Do not overcook. Serve immediately. Slice parsnips in half, length-wise. Brush with oil olive. Sprinkle with salt and pepper. Grill parsnips on the grill until just charred (about 5 mins each side). Remove from grill, allow to cool and chop into 1/2 inch matchsticks.